If you want to crack the toughest National Defense Academy Examination under the coaching and guidance of top experienced faculty in Delhi to join Indian Army, Indian Navy, and Indian Air Force then you must choose the NDA Coaching in Delhi. Delhi Career Group is the leading NDA Coaching Centre that provides 100% result oriented training. More than Thousands of students apply for NDA exam, but only a handful of students crack the exam, the reason is that to clear the exam aspirants need proper guidance and training in an education friendly environment with the coaching of experienced and dutiful teachers. 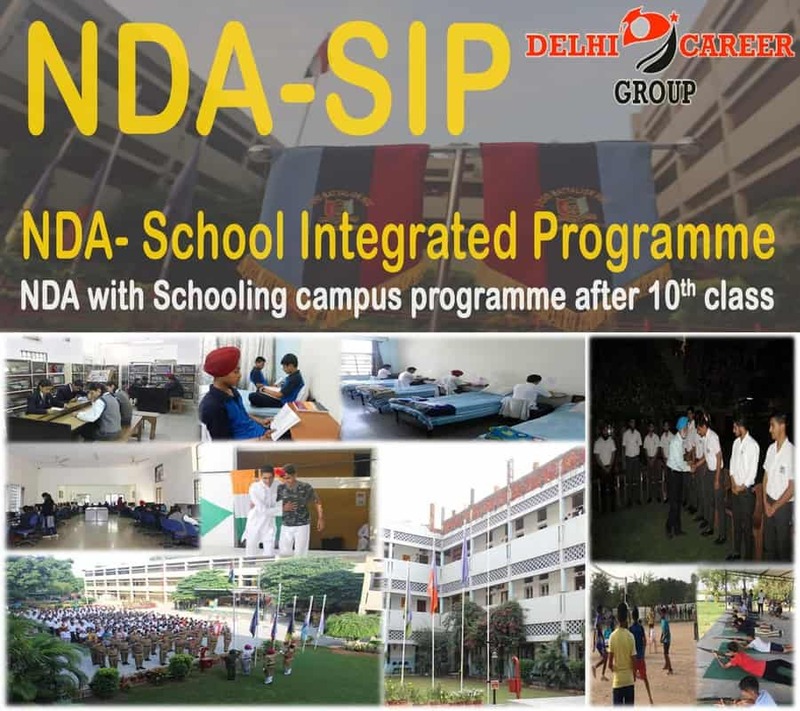 These are all the Facilities provided by one of NDA Coaching Institutes in Delhi -Delhi career Group. 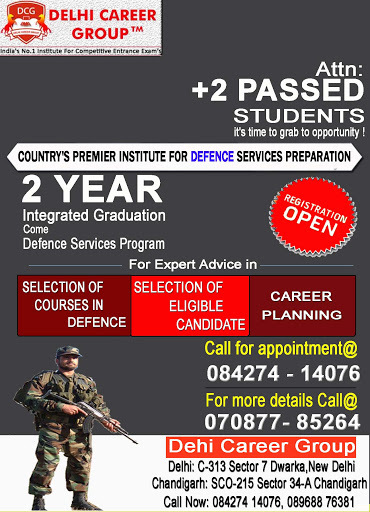 DCG Defence Institute , the Best NDA Coaching Institutes in Delhi provides result oriented training for those aspirants who wants to crack the National Defense Academy Examination to get Prestigious and highly paid jobs in the Indian Army, Indian Navy, and Indian Air Force. Delhi Career Group, the best NDA Coaching in Delhi, has been Providing Quality Education for more than 16 Years. UPSC conducted NDA Exam every year in the month of April and September/October. You will not only prepare Syllabus of NDA, but also learn personality development and communication skills. DCG Defence Academy is recognized as an NDA Coaching Institute in Delhi as we announced results every year with pride. Classroom courses of 1 to 2 years or crash courses of 1 month, 2 month and 3 months are also available for NDA preparation. If you are going to make a big step towards your career you need the right guidance and directions so you will not get lost in this competition of getting a higher rank in the Exams. Best NDA Coaching Centre in Delhi Provide all study material that covers all the NDA Syllabus, 16 booklets set that contains the entire latest syllabus and previous years’ question papers. We Provide Easy to understand Study notes that contain all Subjects such as Math, English, G.K., Chemistry, Physics and Others. Our coaching centre has the expert faculty to teach Mathematics, General ability test, English, General Knowledge. Other facilities Delhi career coaching Centre Provides is Educational Friendly Environment, Advanced and Modern Equipments in the classes, most qualified and dedicated Faculty and Latest Training aids. The Main AIM of Best NDA Coaching Centre in Delhi is to Provide Quality education and training to the aspirants. Regular Classes and Proper Doubt Clearing sessions, and time to time analysis of every student’s problem are other advantages of Best NDA Coaching Centre in Delhi. If you want 100 % results, then you must join DCG Defence Classes Top NDA Coaching in Delhi. If you are not from Delhi but want to enroll in NDA Coaching Centre in Delhi then you don’t need to worry as Best NDA Coaching Centre in Delhi Provides Hostel and PG Facilities for students outside from Delhi. At the time of admission you can choose Batch timing. All the coaching and guidance Under Retired COL B.S Puneet Sehgal Sir, Who is a Joint Director Recruiting for Officer Selection at Army and Director Recruiting While in Army Service. Moreover, the strategy is very unique that is the experienced faculty not only teaches, but also provides solid and compulsory revision of previous ten years paper to every batch. The admission process of Delhi Career Group is very simple, fill the online form at website with just a few clicks or you can walk in to get admission and start your classes according to provided batch timings and day. Get admission and turn your dreams of becoming army/navy/air force Officer into reality. All in all, Coaching for NDA is very important as you will get motivation in the competitive environment of institutes and highly experienced teachers will be by your side to help and guide you anytime. Enroll now and start the preparation to achieve your goal of achieving a higher position in Indian armed forces with our right guidance and excellent coaching. Delhi Career Group is one of the Best NDA Coaching Institutes in Delhi with its totally commanding and legit education system. Our DCG Defence Classes provides the 100% assured result oriented Coaching in Delhi for NDA. We will always deliver the world class quality coaching services at our disposal at lowest ever cost around your area In Delhi. We don’t think much about quantity & cost what we consider is just to give the opportunity to every individual to have a desired career at National Defense Academy with our Best NDA Coaching in Delhi. NDA Exam is conducted to give a chance of working in armed forces to those who desire the same. NDA Exam Coaching in Delhi will help you pass the exam and get the perfect and your wished job at national defense academy with its coaching covering major parts of Delhi including GTB Nagar, Laxmi Nagar, Karol Bagh, Uttam Nagar, Punjabi Bagh and Rohini. All you need to do is just be quick to get to us as we are the providers of Top NDA Coaching Delhi. This exam contains math, English, Reasoning, Computer and Indian History as its main subjects. We provide these all subjects under our arsenal with proper coaching to all elements of these subjects. Our NDA coaching center at Dwarka is working from last 7 years and has grown up as the biggest provider of pass students of NDA Exams. We are enlisted as one of the legendary coaching centers in Delhi NCR, Mukherjee Nagar, New Delhi for our sheer dedication towards our hard work in National Defence Academy Exam. Our Institutes in Gurgaon (Haryana), Gurugram, Noida (Uttar Pradesh), Faridabad, Sonipat, Ghaziabad (UP), Badarpur and Munirka are giving the Coaching Classes for NDA Exam but not every center is providing you the 100% assurance of passing the NDA Exam as our foundation coaching for NDA Exam in Delhi is providing you. We assure you because we know that we will definitely help you to pass the NDA Exam as we have done it in the past and we will deliver the same in future. Passing the NDA Exam is a bit difficult as it contains the three most difficult subjects in it. Math, English, and Reasoning are the hardest for our Indian students especially for those who didn’t study at the convent schools. So for those students, we are here to provide the NDA Coaching Classes in Delhi. With our Coaching, you will certainly get through the exam with passing and also you will definitely top the merit list so that your chances are higher than others. This written exam can bring your opportunity to make your career in your desired field. You can also get the NDA Written Exam free Tips for your better future for your career. You can avail our top coaching services including the best in class infrastructure regarding campus building, healthy classrooms, friendly atmosphere and coaching method that can make your learning comfortable. We are the top rated NDA Coaching Academy in Delhi and we have gained the tag of being the best by our dedicated coaching which has let many individuals get their dream jobs in Defense field incorporating army, armed forces, and intelligence agency. Delhi Career Group, the Best NDA Coaching Delhi, Provides Best Training to the NDA Aspirants In Delhi. To Clear the Entrance Exam of National Defense Academy to Join the Army/Navy/Air Force Training you need the Right Guidance and Coaching. Every Year more than Thousands of Candidates Apply for the exam, but the only Handful of Candidates can Clear the exam yet This Exam Attracts a lot of Aspirants because of the Many Career Opportunities. Delhi Career Group is known as Best NDA Preparation in Delhi. All the Faculty of NDA Written Exam Coaching in Delhi is highly qualified and experienced. Best Coaching for NDA Exam in Delhi Also has the Facilities of PG and Hostel for the students of other States. The Coaching Facility of Delhi Career Group is Up to the Mark because the main aim of NDA Coaching Academy in Delhi is to make a bridge between aspirants dream and reality. Moreover, all the Searches of NDA Coaching Institutes in Delhi, NDA Coaching Centers in Delhi, Top NDA Coaching Delhi, and NDA Exam Coaching in Delhi, and Coaching for NDA Exam in Delhi, NDA Coaching Classes in Delhi has Only One result and that is Delhi Career Group. Join NDA Coaching Academy in Delhi if you want to Crack NDA Exam in Higher Rank. It is not a big task for us to help in obtaining best results of NDA Exam with our Preparation for NDA Exam in Delhi. Our classes will help you in knowing the exam pattern better by focusing on the previous year’s exam papers. You can also prepare with us and have the luxury of getting learn from world class trained teachers and retired army officers who can share their vast experience with you. Our coaching will help you know your stand better and improve that in quick time. You must not go for anything else except our Best NDA Preparation in Delhi as the quality coaching we will give you without a doubt help you in passing. You are suggested to come to us sooner as our seats are filling up quickly and we don’t want you to wait for another 6 months or a year for your chance to clear the NDA Exam( NDA Coaching Delhi ).